What do great cooks, teachers, & writers all have in common? They’re thieves. Intellectual borrowers, if you will. We can’t help it, right? If your senses are trained within a particular context—to notice flavors, say, or word choice—you are bound to absorb, like a sponge, the methods and ideas all around you. This is a good thing. It cracks your life wide open to a world of possible muses; you never know where or when or by whom you’ll be inspired. As with, for instance, today’s dish. In graduate school, I didn’t do a lot of eating out. I was watching my pennies, as most graduate students are, and given that I had lots of time at home for writing, I found myself in the kitchen a great deal, stirring away at a pot of something while simultaneously working out an essay in my head. However, often it was essential to leave one’s apartment or house for the communal sanctuary of a coffee house or a café with cheap enough fare and an inclination NOT to kick lingering students out. It’s like a friendly greeting, only it’s actually a type of cheese, made from sheep’s milk in places like Greece & Cyprus (they got a lot of sheep there, far as I can tell). But here’s the kicker: YOU CAN GRILL IT. YOU CAN GRILL THE CHEESE. See? Yeah, it’s pretty tasty stuff—develops a lovely crust on the outside which gives way to chewy, tangy goodness on the inside. You can understand how this inspired me, right? This is what I came up with: naan or pita bread smeared with sweet mango chutney (yes, the jarred kind—let’s keep this simple, folks! 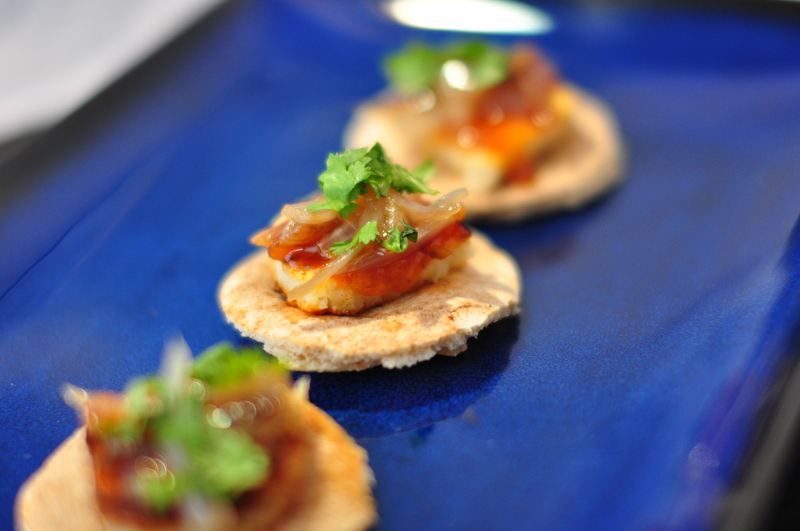 ), topped with a warm piece of grilled halloumi, garnished with slow-cooked red onions and fresh cilantro. Sounds fancy, don’t it? I’ve been serving my newbestfriendforever halloumi at the last few Diwali parties we’ve thrown and it has proven to be a real crowd pleaser, people rushing to their spouses, “You’ve gotta try this!” It’s festive, unusual, and no one will guess that it wasn’t actually that hard to make. Halloumi’s becoming more and more popular, however it still isn’t carried by most “mainstream” grocers. Check Whole Foods or another specialty store, the safest bet being a Middle Eastern purveyor. The flavors of this appetizer will also work for a light dinner or lunch—just sandwich bigger pieces of cheese inside a pita or wrap them up with fresh naan. Be sure to throw in the onions, cilantro, & chutney, too! Caramelize the onions. First, peel the onion & slice it thinly. In a very heavy pot fitted with a lid, heat 1 T butter & 2 T olive oil over medium heat. Sauté the onions gently until they become translucent, then turn the heat down to low. Cook for about forty minutes with the lid on, stirring regularly until the onions are brown, almost disintegrated, like an onion marmalade. If you’d like to go the super-fancy route, make rounds from your bread using a biscuit or cookie cutter. If there’s no need to be super-fancy, just cut the bread into about 2-inch wedges. Slather a generous amount of chutney on each piece of bread. Heat a grill pan over medium-high, coat with olive oil. 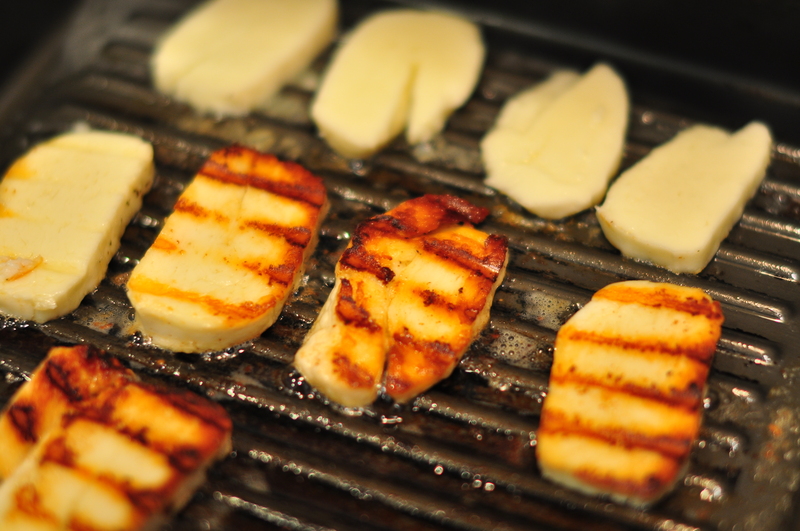 If you don’t have a grill pan, don’t worry, the halloumi will taste just as good, but it won’t have fancy grill-marks, and those are kind of fun. Slice the halloumi a half-inch thick. When your pan is quite hot (but not smoking! ), grill the cheese in batches, cooking until golden brown on both sides, between 8-10 minutes total. The halloumi is best when it’s at least warm, if not hot, so cut the pieces carefully to fit on your bread. If you’re doing this process in anticipation of a slew of guests, you can keep the grilled halloumi warm in a low oven. Don’t leave it too long, though! It tastes much better freshly cooked. Place a piece of halloumi on top of each bread round or wedge. 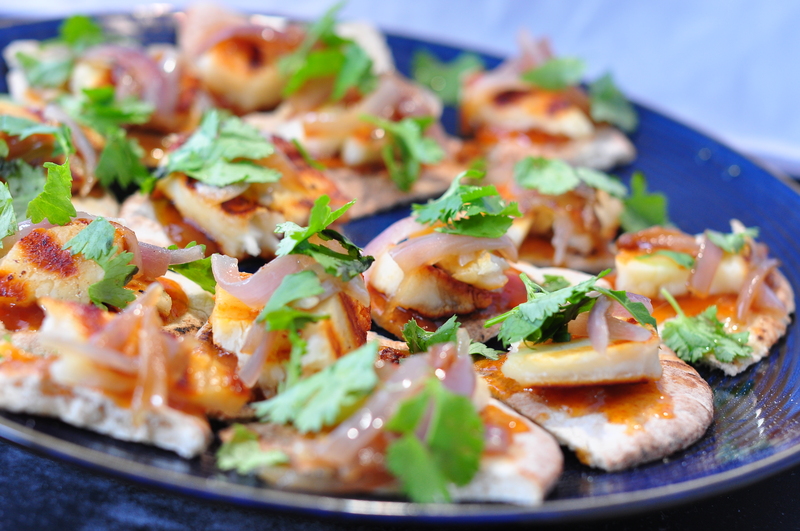 Top with a teaspoon-sized heap of caramelized onion, then garnish with fresh cilantro. You’re writing is always so evocative, I love it. I absolutely love grilled halloumi cheese and it looks delicious in those little bites! I’m so going to greet you this way from now on. Sharon–you’re going to give me a big head! thanks for being my cheerleader, and for reading, of course. courtney–let’s think of some other fun-to-say food words: clafoooooutis, kiiiiwiiiii, kimcheeeeeeee, etc. OH my god. Grilled Halloumi. I’m a little late to the party, on this post at least, but I am totally, absolutely, doing this the first chance I get. I bet my vegetarian, picky-eater brother would go BANANAS for this. Swoon. I just found your post via FoodGawker and am glad I did. I have never heard of halloumi cheese but sure seems like I should have! I live for grilled cheese, especially grillable cheese. I will have to try this on a sandwich very soon.